Steven Soderbergh, in another interview about his film Haywire, dropped a few more hints what his now-defunct version of The Man From U.N.C.L.E. would have been like. Yeah, with that we had a couple of sequences that I thought conceptually were interesting and weren’t necessarily…there was only one hand to hand thing and there was an element in it that made it different than what we were doing in “Haywire.” Then the other action stuff had interesting ideas in it, that were not sort of straight forward, they all had some kind of weird thing going on. But it was also, I mean it was a real spy movie. Scott [Z. Burns, the writer of this and “Contagion”] wrote it so it was dense, it was smart, it was funny. I really like the Harry Palmer films a lot, so there was a lot of that in that. “The Ipcress File,” “Funeral in Berlin” and “Billion-Dollar Brain.” “Funeral in Berlin” I really liked a lot. Scott and I talked about that a lot. We were watching those as we were working on the script. Some intriguing comments, in particular how Soderberger was graviating to the Palmer series, based on Len Deighton’s novels, starring Michael Caine and produced by Harry Saltzman, co-founder of Eon Productions. U.N.C.L.E. was disdained by some (including Albert R. Broccoli, the other Eon co-founder) as a Bond ripoff. But with Soderbergh exiting U.N.C.L.E. last year, it’s a vision we’re not going to see. UPDATE: Thinking about it further, maybe U.N.C.L.E. fans dodged a bullet thanks to Soderbergh’s departure in a disagreement with Warner Bros. over the film’s budget. Napoleon Solo, like James Bond, is a romantic hero, not an antihero. Steven Soderbergh catches up on his U.N.C.L.E. 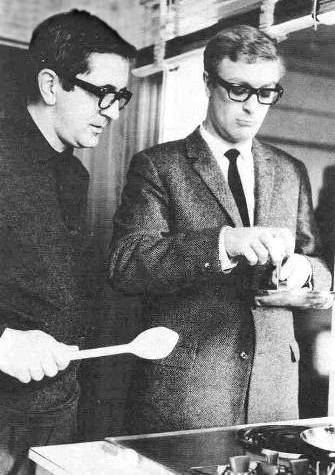 Director Steven Soderbergh, who has said he’s “obligated” to direct a movie based on The Man From U.N.C.L.E., at least has been getting acquainted with the likes of Napoleon Solo and Illya Kuryakin. Sodbergh kept a list, starting in February 2010 and running for a year, of the movies and TV shows he would watch. The list is online (we can’t put in a link right now, but will do so later). It includes 27 of 29 first-season episodes of Man From U.N.C.L.E., an indication Soderbergh is taking the prospective movie seriously. He also read Jon Heitland’s 1987 The Man From U.N.C.L.E. book. He watched the U.N.C.L.E.s starting in late October 2010 through mid-January 2011. Other things of interest on his list were the three Harry Saltzman-produced Harry Palmer movies (The Ipcress File, Funeral in Berlin and Billion Dollar Brain) as well as movies directed by the late Sidney Lumet that starred Sean Connery (The Hill and The Anderson Files Tapes). He also watched some episodes of Mad Men, the acclaimed drama that’s set in the 1960s and Soderbergh reportedly wants his U.N.C.L.E. movie to be set in the ’60s. Coincidence? Probably (he watched the Mad Men episodes in the summer of 2010). But who knows? More interesting? No James Bond movies. Perhaps that’s a sign Soderbergh won’t try to make an U.N.C.L.E. movie into a warmed over 007 film, similar to the 1983 television movie, The Return of the Man From U.N.C.L.E. UPDATE: To view Soderbergh’s list of movies and TV shows he watched for a year, JUST CLICK HERE. Warning: it’s a PDF file. The existance of the list was first disclosed by the Vulture Web site in a post IN A POST YOU CAN READ BY CLICKING HERE. The Vulure site, in turn, is part of New York Magazine’s Web site. You can view the main page of the magazine’s Web site BY CLICKING HERE.